This Quick Start Guide describes how to install and configure all of the software you need, to perform incremental replication operations using SQDR and SQDR Plus. This document describes preparing the source database system and installing and configuring the SQDR Plus Platform. After completing the tasks in this document, continue with the appropriate version of Quick Start Guide to Using SQDR Plus (Part 2), which describes installing, configuring, and running SQDR. We recommend printing out this worksheet and filling in the values as directed by the instructions below. This document is intended for first-time users of SQDR and SQDR Plus. Users who are upgrading an existing installation should refer to the SQDR Release Notes or SQDR Plus Release Notes for upgrade instructions. If you encounter any problems while using the evaluation software, please open a support ticket with StarQuest Customer Support at http://support.starquest.com or call +1 415.669.9619 for assistance. The estimated time to complete all tasks is approximately 2 hours. The StarQuest Data Replicator solution consists of several software components, and involves up to four systems, all loosely connected via TCP/IP. Figure 1 illustrates the four tiers. In some cases, multiple tiers may be running on the same physical server; for instance, Tier 2 (SQDR Plus), Tier 3 (SQDR Platform) and Tier 4 (Destination DBMS) may all be installed on the same Windows system. This document covers topics related to Tiers 1 and 2. This system may be running either Windows or Linux. A local control database (IBM DB2 for LUW Express) is used for staging transactions; when a change is made on the source system, the data is stored here temporarily until it has been retrieved by the SQDR clients and applied to the destination database. SQDR Plus Derby service - the Apache Derby database is used as a control database for the SQDR Plus Launch Agent. SQDR Plus Launch Agent service - the primary SQDR Plus service. The initial process is called the Launch Agent and is used to configure and launch Staging Agents for each configured source system. The SQDR Plus installer includes a JRE (Java Runtime Environment) for running the three services. The SQDR Plus platform can be configured and managed from any system using a browser and the SQDR Control Center web application. The SQDR service is installed on a Windows system. 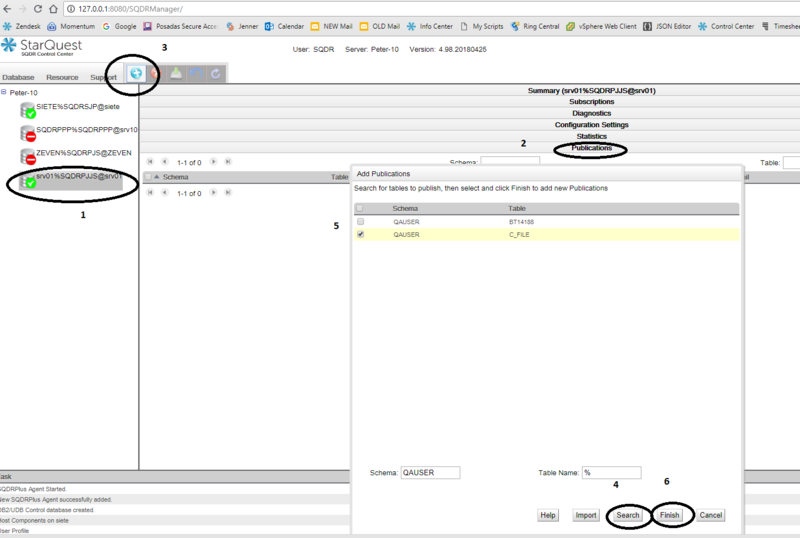 The SQDR installation includes the Data Replicator Manager application for configuring and managing the replications and the StarSQL ODBC driver for connecting to DB2 systems (including the SQDR Plus staging database). The SQDR service uses a local or remote DB2 LUW or Microsoft SQL Server database for its control database. Using a local DB2 LUW database is recommended, especially for the typical scenario where both tiers 2 and 3 reside on the same system. The SQDR installer is included in the SQDR Plus installer for Windows for simplified installation in the typical combined tier2/tier3 scenario. No software is installed on this platform, but it must be accessible from the SQDR Platform. The same individual or a combination of individuals must be capable of performing in the following roles in order to successfully complete the evaluation. Tier 1 Database Administrator is someone with administrative authority on the source system. Tier 2 Administrator is someone with administrative authority to install SQDR Plus and a local DB2 Express database on a Windows or Linux computer. Tier 3 Administrator is someone with administrative authority to install SQDR and either DB2 Express or SQL Server database on a Windows computer. This may be the same role as Tier 2 Administrator in a typical combined tier2/tier3 deployment. Tier 4 Database Administrator is someone with administrative authority on the destination system. The source system should be running Informix 11.70 or later. Be sure that the TCP/IP ports being used by Informix (typically 9088 and 9089) are not blocked by firewalls. The Informix database must be enabled for logging. Connect to the sysmaster database and use the following SQL statement to display what type of logging (Unbuffered, buffered, ANSI, or none) is configured for a database. Look at the values for is_logging, is_buff_log, and is_ansi. You can also view the type of logging in OpenAdmin Tool (OAT) by selecting Databases under SQL Toolbox. 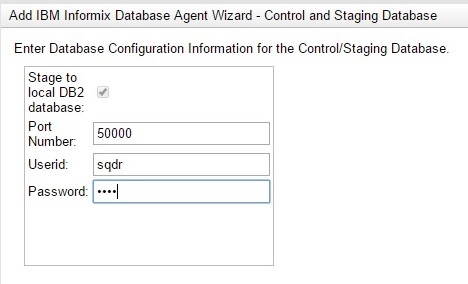 During creation of an SQDR Plus Staging Agent for the Informix host, you will be prompted for the user name and password of a user with sufficient authority to read the database logs on the source system (requires DBA authority to the syscdcv1 Change Data Capture database) and CONNECT and RESOURCE authority to the database containing the tables to be replicated. You can use either the instance owner (e.g. 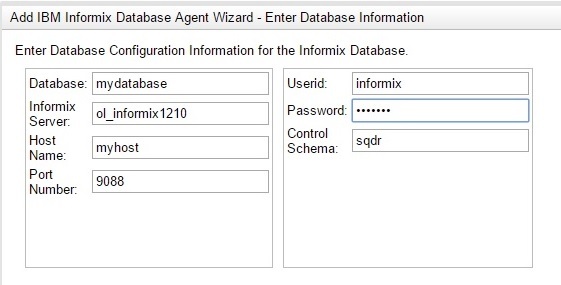 informix) or create a new user for this purpose. See the Informix hints technical document for issues with publishing if you create a user for SQDR. and confirm that the user SQDR has SELECT authority for the tables to be replicated. A schema will be created on the host database (e.g. SQDR) for control tables and stored procedures. The SQDR Plus Platform requires TCP/IP access to the Tier 1 database host and from the Tier 3 Windows platform. Install DB2 Workgroup for LUW (Linux, UNIX & Windows) 11.1 for use as a control database and temporary store for SQDR Plus. DB2 Express is bundled with SQDR Plus. Before installing DB2, plan what user account will be used to run the DB2 services. In most cases, this will be a local user e.g. db2admin. However, if you will be running the SQDR Plus services using a domain user rather than the default of Local System Account (for instance, when accessing a SQL Server source database using Windows authentication), then the DB2 services must also use a domain account (e.g. mydomain\db2admin); that account should be a local Administrator, and should be created by the domain admistrator before installing DB2. Verify that the drive where you intend to install DB2 has 8.3 naming enabled - see the 8.3 naming discussion in Tips for the SQDR Plus DB2 LUW Staging Database for details. We have found that 8.3 naming is typically enabled for the system drive (C:), but disabled for any additional drives. Click Next through several screens, accepting the default settings. If desired, you can choose to install the DB2 software in a location other than the default. Enter a password for the local user db2admin (Windows) or db2inst1 (Linux) to be created by the installer; this password should meet the password policy requirements of your operating system. OR - if you will be using domain accounts for DB2 and SQDR Plus services (e.g. for SQL Server Windows authentication), enter the credentials for an existing domain user e.g. mydomain\db2admin; that user should be a member of the local Administrators group. If the installing user is not a domain administrator, you will get the expected warning The domain ID and password cannot be verified because domain administrator privileges are required. Be sure you have entered the correct credentials and continue the installation. Leave the checkbox Use the same account for the remaining DB2 services enabled. Click Next through several screens. On Set up notifications, set up a notification SMTP server if desired. On Enable operating system security for DB2 objects, unselect the checkbox Enable operating system security. The DB2 installer will create an instance that starts automatically with the system. Examine the properties of the instance to determine the port number; the default port number is 50000. Plan the location of DB2 database files and logs; we recommend using high performance drives (e.g. SSD) and isolating the disk activity of DB2 database files and logs from other system activity. We recommend specifying those locations during installation of SQDR Plus. sqdr - SQDR client user. This account requires no special operating system authorities, but it must be named sqdr. It is used for communication from the SQDR client platform and is the owner of the control tables and stored procedures stored in the SQDR Plus control database. You will be prompted for this user and password by the SQDR Control Center when creating a connection to the source database. It is also used for running the three SQDR Plus services. Edit /etc/group and add sqdr to this group. See the Quick Start Guide to Using SQDR Plus (Part 2) for considerations for the Tier 3 Windows platform that will run SQDR. Perform the tasks in the order described, noting that some provide information used in subsequent steps. The detailed instructions for each task follow this summary. Request to download SQDR Plus. Receive the e-mail with a Registration Key and download links for StarAdmin, SQDR, and SQDR Plus. Print the SQDR Plus Worksheet and use it as a guide while following the instructions below. Tier 1 Database Administrator: verify pre-requisites on the host database. Tier 2 SQDR Plus Platform Administrator: Download SQDR Plus using the download link from step 2, complete the pre-installation tasks (including creating users and installing a local copy of DB2 Workgroup 11.1 for use as the SQDR Plus control database), and install the software on the SQDR Plus server. Tier 1 SQDR Plus Platform Administrator or Tier 1 Database Administrator: Use a browser to connect to SQDR Control Center (SQDR Manager) to verify installation. 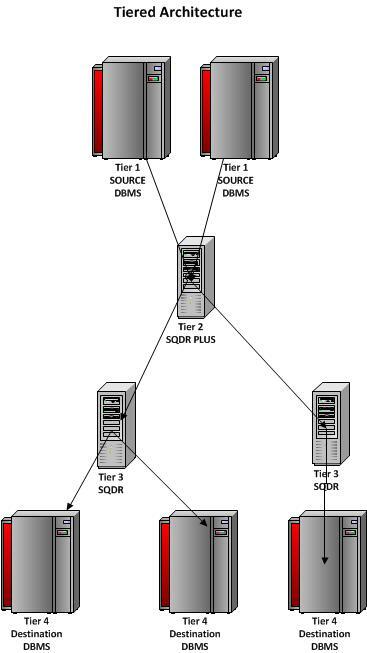 Tier 1 Database Administrator: Use SQDR Control Center to configure a connection to the source database. Tier 1 Database Administrator or Tier 2 SQDR Plus Platform Administrator: Verify SQDR Plus installation and test Support functions using SQDR Control Center. Continue to Quick Start Guide to Using SQDR Plus (Part 2), which describes installing, configuring, and running SQDR on the Tier 3 platform. All software packages are distributed as compressed files that you download from the StarQuest Ventures Web site. From a web browser enter the address http://www.starquest.com/ and click on Download for Trial under the Products menu. Request to download SQDR Plus. After submitting a request to download SQDR Plus, you will receive an e-mail containing a Registration Key and download links for the SQDR Plus, StarAdmin, and SQDR software. The registration key will be used in step 4b in Part 2 to obtain temporary license keys valid for 15 days and the download links will be used below. See Tier 1 host computer requirements above. You do not wish to customize the database files and log files used by the local DB2 (note that these files should be located on separate drives for best performance). You wish to use /var/sqdrplus for SQDR Plus working directories. You do not need a silent install. The SQDR Control Center (Jetty) will be listening on ports 8080 and 8443. You wish to start the SQDR Plus services immediately after installation and at system boot. If the default values are acceptable, you can skip Step 6, and the default configuration setup.conf.template will be copied to setup.conf by the installer. Verify the Tier 2 prerequisites: DB2 Express for LUW 10.5 should be installed and running, firewall exceptions defined, and Linux user sqdr created and added to the SYSADM_GROUP (e.g. db2iadm1). Using the link provided in the confirmation e-mail, download the SQDR Plus software. If you need to make any changes to the default configuration, copy setup.conf.template to setup.conf (i.e., cp setup.conf.template setup.conf). Then open setup.conf in a text editor and make the desired modifications. For instance, to change the locations of DB2 database files and log files, modify the values for DB2DFTDBPATH and DB2NEWLOGPATH as directed in the comments. Execute the setup script by entering ./setup to begin the installation. Respond Yes ("y") to the "Are you ready to continue (y/n)? 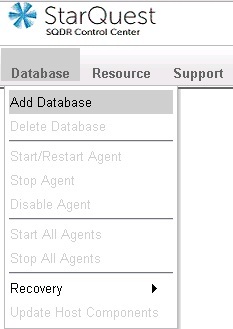 prompt and provide the password for the Launch Agent Control Database (Derby). Do not supply a sensitive password, as this value is stored in a non-secure manner. You will be prompted for this password when connecting to SQDR Control Center. The installation will complete; examine the output for errors. To verify the SQDR Plus installation, connect to the SQDR Control Center with a browser by either selecting the SQDR Control Center shortcut in the SQDR Plus program group (Windows only), or by starting a browser and entering the URL http://127.0.0.1:8080/SQDRManager (assuming you accepted the default jetty port values during installation). You can also connect to the SQDR Control Center from another machine by starting a browser and entering the URL http://mysqdrplus:8080/SQDRManager or https://mysqdrplus:8443/SQDRManager (where mysqdrplus is the hostname of the SQDR Plus platform). Be sure that the firewall has been configured to accept incoming connections on these ports. If you select the SSL connection and are using the self-signed SSL certificate included with the installation, the browser will issue a warning about the certificate; allow an exception to connect. When prompted for credentials, enter user SQDR (upper-case) and the Launch Agent Control Database (Derby) password you supplied during installation. If the services are not started, examine the Launch Agent log and Derby log, as well as wrapper.log for each of the three services. The default location of the log files is /var/sqdrplus. If the services are running, verify that the ports are not being blocked by a firewall. Verify that the ports are not in use by another application. Stop the SQDR Plus services and view the ports in use by entering netstat -t -n -p -l. It is not uncommon for port 8080 to be in use by a Java-based server such as tomcat or a RAID management tool. If anti-virus software is installed, verify that it is not interfering with operation. Specifying the location of the DB2 LUW control database files and logs: If you wish to specify the location of the database files or logfiles used for the local DB2 LUW control database (for example, you wish to place them on a high speed drive) and you did not specify the desired locations during installation of SQDR Plus, change them now by editing the Launch Agent's configuration and restarting the Launch Agent service - see Specifying the location of DB2 database files or Specifying the location of DB2 logfiles in Tips for the SQDR Plus DB2 LUW Staging Database. Connect to SQDR Control Center with a browser as described in the previous section. Logon as user SQDR, using the Launch Agent Control Database (Derby) password as supplied during installation. Select Add Database from the Databases drop-down menu. Host Name : Host Name or IP address of the source system. Port Number: enter the port of the source system. Userid: an existing user on the source system - either the instance owner (informix), or a user created for this purpose (e.g. sqdr).. Password: password for the Userid. Control schema: use the default value (sqdr) unless there are multiple SQDR Plus systems accessing this host database. If the Userid is not the instance owner (informix) or has not been granted DBA to the source database, you must use the same name (e.g. sqdr) for both Userid and Control Schema. SQDR Plus will create this schema on the host database and populate it with control tables and stored procedures. The values below Local DB2 database refer to the local DB2 for LUW database system which was installed as part of the Tier 2 SQDR Plus Platform Prerequisites above. Port Number: enter the port of the local DB2 database. Default is 50000. Password: enter the password of the Windows or Linux user sqdr created on the SQDR Plus platform as part of the Tier 2 SQDR Plus Platform Prerequisite above. Select the Next button and configure the logging and optional email notification values. You can leave these fields blank during the installation and configure the email notification feature at a later time. Select Next to create the Agent. This operation may take a while. Verify that the new DB2 LUW control database (e.g. SQDRP0) was created on the desired drive (as specified in task 3 in Step 7 above) - e.g. if you specified the D: drive, expand D:\DB2 and look for a folder named SQDRP0. When you see a plus sign next to Databases, expand Databases and select the new database. 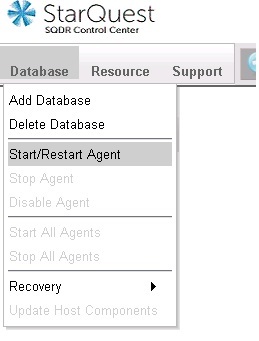 Choose Start/Restart Agent from the Database drop-down menu. Selecting Start/Restart Agent creates the Staging Agent on the SQDR Plus system and creates configuration tables and stored procedures on the source system. This process may take several minutes; a green checked icon will appear next to the database name when the process is complete. If the icon remains red or yellow, additional troubleshooting may be required before proceeding. Use the SQDR Control Center to verify that the Capture Agent is running and to test the Publication and Support functions. Connect to SQDR Control Center with a browser and logon as described above. Expand Databases and select the desired database. Verify that the Staging Agent is running by observing that there is a green checked icon next to the database name. Verify that the SQDR Plus platform can send SQDR Plus support logs to StarQuest Customer Support by selecting Send Logs to StarQuest from the Support drop-down menu. This will collect and transfer support files directly to StarQuest. If the SQDR Plus platform is not able to reach external ftp sites, select Save Logs to local file system (as zip file) to create and store the support files on an alternative computer. Send these files to StarQuest Customer Support if requested to do so. Test the Publication function. Note that publishing tables before creating subscriptions is required for Oracle source databases. Select the Agent and then select the Publications panel in the right window. Next select Add Publication from the Resource drop-down menu or the Plus sign from the top of the window. For DB2 for i and Oracle source databases, you will be prompted for the credentials of a user with sufficient authority to grant access to the Agent user (e.g. SQDR) for the tables to be subscribed to; this will typically be a user with SECOFR or SYSTEM authority. Enter schema and table names (you can use SQL wildcards like %). Select one or more tables to be published. A state of "Published" indicates a successful publication. Continue with the appropriate version of Quick Start Guide to Using SQDR Plus (Part 2), which describes configuring and running SQDR on the Tier 3 platform.